Luig Zingales writes a very interesting article about some of the new scandals in financial markets (the insider-trading trial of Raj Rajaratnam). While we have seen similar scandals in financial markets before, he argues that this time the methods used to investigate the case and the involvement at the prosecution level are unusual. In addition, the fact that others like Raja Gupta (former worldwide managing director at McKinsey) or a managing director at Intel (Rajiv Goel) are involved, could make this case an important one that will create an even deeper dissatisfaction among the general public about what is going on in financial markets and institutions. "It is so difficult to imagine that successful executives would jeopardize their careers and reputations in this way that many of us probably hope that the accusations turn out to be without merit." "Those of us who have looked to the self-interest of lending institutions to protect shareholder's equity – myself especially – are in a state of shocked disbelief." "After ten weeks of a trial like this, it will be easy for the public to conclude that all hedge funds are crooked, and that the system is rigged against the outsiders. Fortunately, this is not the case. While there are certainly some rotten apples in the hedge-fund industry, the majority of traders behave properly, and their legitimate research contributes to making the market more efficient." 1. Those who assumed that this was a generalized phenomenon and concluded that most cyclists were guilty. 2. Those who had the belief that this was just a few riders violating the rules but, overall, this was a clean sport. Their logic was that if doping was so generalized, how is it that we have not heard about it before? Over the last years, we have witnessed an increasing number of scandals in this sport and what is worse is that the riders accused were some of those who had won the major races in the world (Tour de France, Giro d'Italia or Vuelta de España). The fact that most of the riders who finished in the top spots of these races in the last years have been associated to these scandals has shifted public opinion towards the belief that doping was (and might still be) a generalized practice in this sport. I see a parallel with what we are seeing in financial markets as a result of the more recent scandals. Yes our prior is to believe that generalized corruption will be eliminated by market forces and regulation. But when we think about all the evidence that has surfaced during the last years regarding the behavior of financial institutions and those who lead them, our beliefs start shifting and at some point it is not simply a matter of questioning individuals. We start questioning the whole system, the incentives and the ways in which some become winners in this very competitive market (as competitive as the world of professional cycling). The difference between cycling and finance is that while we can choose not to watch the next Tour de France but we cannot choose to live in a world where the behavior of financial institutions does not affect our society. European Union countries are coming up with new proposals to provide a stricter framework for fiscal policy. EU members have lived for more than a decade under the rules of the Maastricht Treaty and the Stability and Growth pact that set numerical limits on government deficits (3%) and debt (60%). While numerical rules are attractive (they are simple and transparent) the experience of EU countries has shown that, by themselves, they are not very good at providing fiscal policy discipline. There are many reasons why these rules have not worked as well as expected: they do not provide enough discipline when it is most needed (during economic booms), the enforcement mechanism is decided by the offenders (ministers of finance), etc. In addition, even if the rules are supposed to be objective and transparent, they have always been subject to different interpretations. In particular, the limit on government debt (60%) has been consistently violated by many countries - today most countries are above this limit. They have all used as an excuse a clause that allowed deviations if the ratio was sufficiently diminishing toward the 60% level. But what does it mean to "sufficiently diminish toward the 60% level"? "The debt criterion of the EDP is to be made operational, notably through the adoption of a numerical benchmark to gauge whether the debt ratio is sufficiently diminishing toward the 60% of GDP threshold. Specifically, a debt-to-GDP ratio above 60% is to be considered sufficiently diminishing if its distance with respect to the 60% of GDP reference value has reduced over the previous three years at a rate of the order of one-twentieth per year. Non- compliance with this numerical benchmark is not, however, necessarily expected to result in the country concerned being placed in excessive deficit, as this decision would need to take into account all the factors that are relevant, in particular for the assessment of debt developments, such as whether very low nominal growth is hampering debt reduction, together with risk factors linked to the debt structure, private sector indebtedness and implicit liabilities related to ageing. In line with the greater emphasis on debt, more consideration should be given to relevant factors in the event of non-compliance with the deficit criterion, if a country has a debt below the 60% of GDP threshold." Maybe I am too pessimistic but the number of potential excuses that are being introduced in this paragraph makes me think that this is not going to work either. I have written a few papers on this issue, the difficulty of enforcing strict numerical fiscal policy rules and the failure of the Euro experience (Here is one example, and here is another oner). Some of the other proposed changes (e.g. establishing national fiscal frameworks of quality) are more promising, but if they keep relying on strict and asymmetric numerical targets, I doubt they will achieve the necessary level of fiscal policy discipline. Finally, here is a very interesting presentation on this issue from the perspective of the Chile experience by Andres Velasco, former finance minister ( via Phil Lane and the Irish Economy Blog). Our last post led to reactions from Mark Thoma, Nick Rowe, Paul Krugman and Brad DeLong. And, as some of the posts make clear, there is not always agreement about about how to think about the effects of fiscal policy on GDP. The debate has centered around what economists call Ricardian Equivalence a result that one can find on any macroeconomics textbook and shows that under some circumstances changes in fiscal policy have no effect on GDP and employment. 1. Should government spending be counted as GDP? If governments end up hiring workers to dig holes and them fill them up again, why is this considered as valuable production? This is a valid point but much broader than the current debate. I do not have strong views with respect to this point, I can imagine questioning the way we measure GDP on several grounds but this was not the main point I was trying to make. My assumption is that the government was buying goods that are valuable and therefore should be counted as GDP. But were I have strong views is that we should not confuse this argument with the one that separates the effects of changes in government consumption versus investment. Government consumption can be valuable (provision of healthcare, education and other public services) as much as government investment. It is not only government investment that should be counted as GDP. And this is where I felt that the original statement from the World Bank chief economist was not clear enough. That he seemed it imply the need to look for expenditures that raise the productivity of the economy. 2. The second debate is about the validity of the Ricardian Equivalence proposition. This proposition says something very simple: if the governments cut taxes today and does not change the path of spending, then the private sector should anticipate the future taxes required to pay for government spending and decrease consumption by exactly the same amount as the increase in government spending. In this case GDP does not change. Realize that here we are ignoring the first point and counting government spending as GDP (otherwise GDP will be falling). This result (Ricardian equivalence) does not apply to cases when government spending changes. To be more precise, depending on whether the change in government spending is transitory or permanent we get some or no effects. The Ricardian Equivalence proposition requires many assumptions (perfect foresight, no financial constraints in the private sector, all taxes are lump sum, etc). Some believe that these assumptions are unrealistic and that is why they believe in a world where Ricardian equivalence does not apply. The assumption that I was questioning in my post was the fact that models where Ricardian Equivalence applies are models where the economy is in equilibrium. For simplicity you can think about it as the economy always being in full employment. But this is not a good characterization of many economies today. Why does it make a difference? Because with full employment, the only way to grow output and income is by increasing productivity (or by changes in the labor force participation). What happens in a world where unemployment is high and there is a large output gap? Depending at which speed the economy returns to potential, we have a different path for income and potentially for private spending. If fiscal policy raises employment and income by closing the output gap faster, private spending will increase even if the other assumptions are still valid. Of course, this does not mean that any fiscal policy measure will do the job (if the government increases the purchases of foreign luxury cars, it will not do the trick...), but there is a potential to increase income and therefore move away from the Ricardian equivalence proposition. In December 2000, Bill Clinton announced that the "The United States is on course to eliminate its public debt within the next decade." According to the 2001 budget presented by his administration (during the year 2000), the government debt held by the public would decrease from about 3.7 trillion at the end of 1998 (42% of GDP) to 377 billion by 2013 (around 3% of GDP). This prediction turned out to be highly inaccurate as today (2010) government debt in the US has reached close to 9 trillion (60% of GDP). What went wrong? Did the New Economy led to unrealistic macroeconomics assumptions or did the next administration(s) behave differently from what the Clinton administration had predicted? Figure 1. 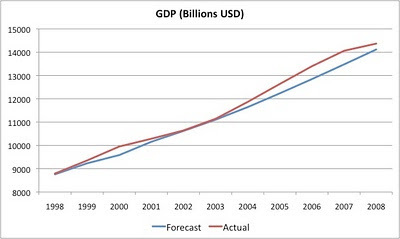 GDP Forecast from 2001 budget compared to actual GDP. 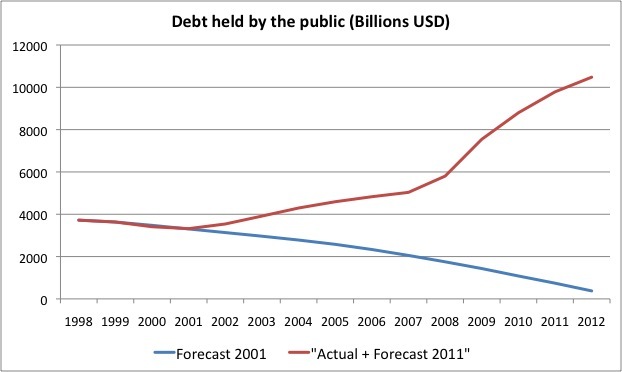 In contrast, the debt held by the public grew at a much faster rate than it was anticipated. Starting with the 2001 year, government debt accelerated and deviated from the optimistic assumption that the government would keep taxes and spending at levels that allowed for a continuous reduction of debt levels towards zero. Taxes were cut and without a restrain on spending, deficits and debt grew. compared to the actual figure. 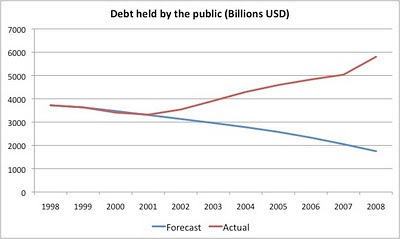 In the figure below I extend the series to 2012 by comparing the forecast made in the 2001 budget as well as the forecast made in the current 2012 budget. After 2008 the two series keep deviating from each other and this time is not all about political decisions, we also have the effect of a worse-than-expected growth performance in the 2008-2010 period. 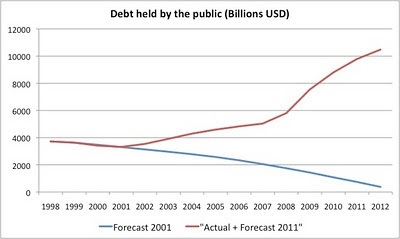 as forecasted in the 2001 and 2011 budgets. Ensuring long-term stability in public finances is not easy. Governments face uncertainty about macroeconomic conditions and their political choices need to be consistent with their macroeconomic forecasts. What the example above illustrates is that the macroeconomic uncertainty was not responsible at all by the deviation in fiscal policy outcomes from their forecasts in the 2001-2008 period. It was a set of different policy choices after 2001 that sent the budget into larger deficits and the debt levels towards an unsustainable path.